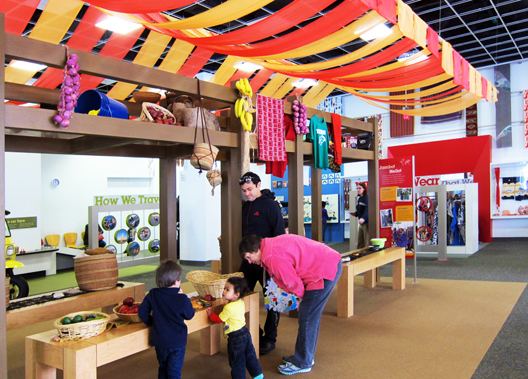 Our World, the main indoor exhibition at the National Children's Museum, helps children develop a life-long curiosity about the world and cultures that surround them. Designed primarily for children ages 3 to 8, the exhibit introduces visitors to the responsibilities and rewards of both global and community citizenship through three key areas: Map Zone, My Town and World Cultures. Children are encouraged to think about the similarities and differences among our global societies, and explore the various roles they may play in their communities, such as family member, friend, neighbor, student, team member and citizen. The World Cultures area celebrates cross-cultural awareness and interaction, allowing visitors to discover and explore different pieces of our cultural mosaic and how geographic factors shape the differences between us.